The first stop is on the campground itself! This is a close by (just 7 KM from homestead) beautiful safe swimming hole part of the Crocodile Spring Loop. 100 m from the parking. 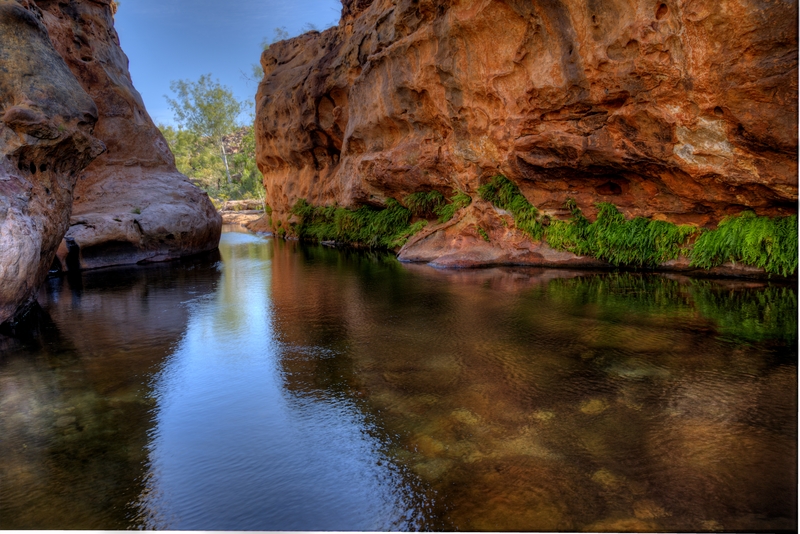 Just a little further than Tristan Pool, you will find this beautiful pristine clear waterhole. It is a perfect place for drive during a warm day. This waterhole invite for a paddle! The is water is clear and fresh with a lovely sandy bottom throughout the year. This is for geology and rock formation enthusiast! Chemical weathering has created beautiful fern patterns on the surrounding cliffs. This is a 600 m walk upstream following the dry stream bed. If you are fit, keen and adventurous, this is a must. Keep your eyes open for the large caves on the side of the mountains. Beautiful clear pool water, hidden under a rocky outcrop. Climb down the ledge to feel the water or take a plunge. A must see for even a short stay. 500 metre-walk. The kids will love it! Especially those of us that are big kids at heart. A natural flat rock water slide, a deep fresh water rock pool with a wonderful scenic lookout, offers something for everyone! Another 500 metre-walk upstream from the waterslide. Follow the creek that flows into the waterslide and you will find these lovely stepped waterfalls. The flow rate varies incredibly on the time of the season! Follow along the escarpment to discover incredible rock formations, hot and cold water springs. From Lorella’s homestead: 1 hour- 40 km. Only newly accessible, this is People’s Choice #1 from last year’s feedback surveys! This year we have opened another two swimming places in the same area – LE SPA and FERN GULLY, so make sure you have a whole day to explore this magnificent part of Lorella. Suggestion: Take a picnic and spend the day swimming at Nanny’s Retreat, then head further up the Yiyinti track and relax to the sound of the flowing water at your private remote camping spot by Sloshy Spring. The next morning, make the most of the morning light at LE SPA for another swim and a short walk before enjoying the sunlight right through the deep water hole at to FERN GULLY. Park your vehicle over the cliffs of the sunken rock basin and make your way to its beautiful rock swimming pools and falls. Hidden behind huge mountains is the secret and truly unforgettable falls of Lorella. This journey is well worth the effort and the scenery surrounding. Awe inspiring views. This is a new spot waiting to welcome tourists. This is another hot pool on the station. When the water comes out of the the spring it is about 50 degrees Celsius (hot!) but it cools down enough to swim in when it reaches the actual pool. Surrounded by shady trees and Pandanus Palms gives it a tropical touch all year long. A good stopping point to or from the coast. This pool was discovered by accident while going towards the secret fishing spot. A great spot to swim and refresh before heading to the coast. This is a kilometre-walk upstream, following the dry stream bed. If you’re fit, keen and adventurous, this is a must. Keep your eyes open for the large caves on the side of the mountain. One of our newest additions- Le Spa is a great swimming water hole alongside Nanny’s Retreat and others. Fern Gully is 600 m hike from the car park of Le Spa. This pristine clear waterhole was open just last year. Certain times of the year the cattle yards will be off limits while mustering. These hot springs are HOT, with a lovely private bush camp. Massive flocks or red tailed black Cockatoos inhabit this area at certain time of the year. Enjoy a swim or canoe ride at Rosie Rapids.